A bit of felting. I've admired the Noni bags for ages and wanted to get a pattern, particularly for the fabulous felted flowers. Selected my bag pattern whilst at Webs and was checking inside to find out how much Cascade 220 yarn was required, only to find the bag pattern didn't include the instructions for the flowers. 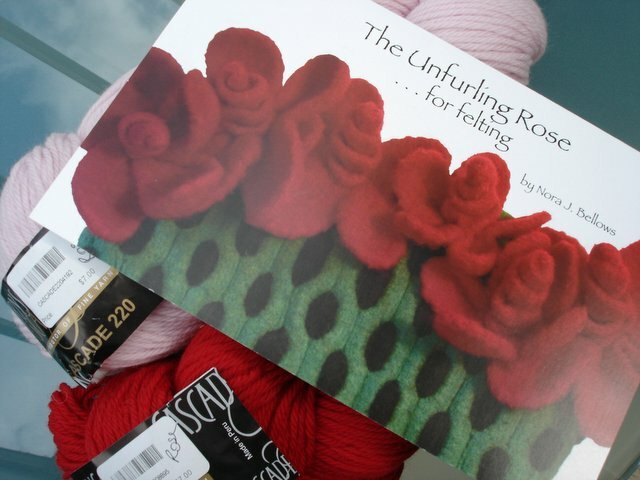 So, decided to just go for the felted rose pattern; though the camellia was great too, it will have to wait. Since arriving home I have discovered that Get Knitted have the Cascade 220 yarn too and at £4.99 a skein, just a bit more than the $5.75 I paid for mine. Still, when I want more roses, I'll know where to shop.